This year marks the 10th anniversary of my ballet curtain call photography. My interests in ballet and photography merged in 2005; during curtain calls for Julio Bocca’s final ABT performance, I regretted not having a camera to capture this historic moment as Julio bid farewell to his adoring fans. I have not made that mistake again, as I have since captured ABT dancers during their curtain calls, in addition to dancers in other companies. I am honored to have captured such great dancers as Angel Corella, Ethan Stiefel, Paloma Herrera, Nina Ananiashvili, and Irina Dvorovenko. Alessandra Ferri and José Manuel Carreño. Click for more photos. Here is one of my first efforts, a photo of the great Alessandra Ferri and José Manuel Carreño in Romeo and Juliet in 2006. It was taken with an inexpensive pocket camera, a Canon Powershot. Curtain call photos are common these days as everyone has a camera, whether it is a smart phone, small camera, or large DSLR. Several years ago, I snagged a last-minute ticket for ABT’s Swan Lake in the upper reaches of Lincoln Center. During the curtain calls, I looked down into the orchestra section as the dancers were taking their bows. There were literally hundreds of smartphones and other photographic devices turned on as audience members wanted to capture the moment, either through photos or video. The mantra of the social media age: “Pics or it Didn’t Happen” as audience members seek a souvenir of an evening of dance. Irina Dvorovenko and Maxim Beloserkovsky. Click for more photos. My early efforts were in the Pics or it Didn’t Happen spirit. The photo quality was generally not that great, but spending time processing the photos forced me to think about what I liked and didn’t like and gave me experience in what to look for. Here is a photo of Irina and Max in Don Quixote, taken with a better but not great camera, Canon Powershot SX100. The camera didn’t have a rapid burst mode, so I had to time everything just right, in this example, just as Irina passed a rose to husband Max. Nina Ananiashvili final performance. Click for more photos. 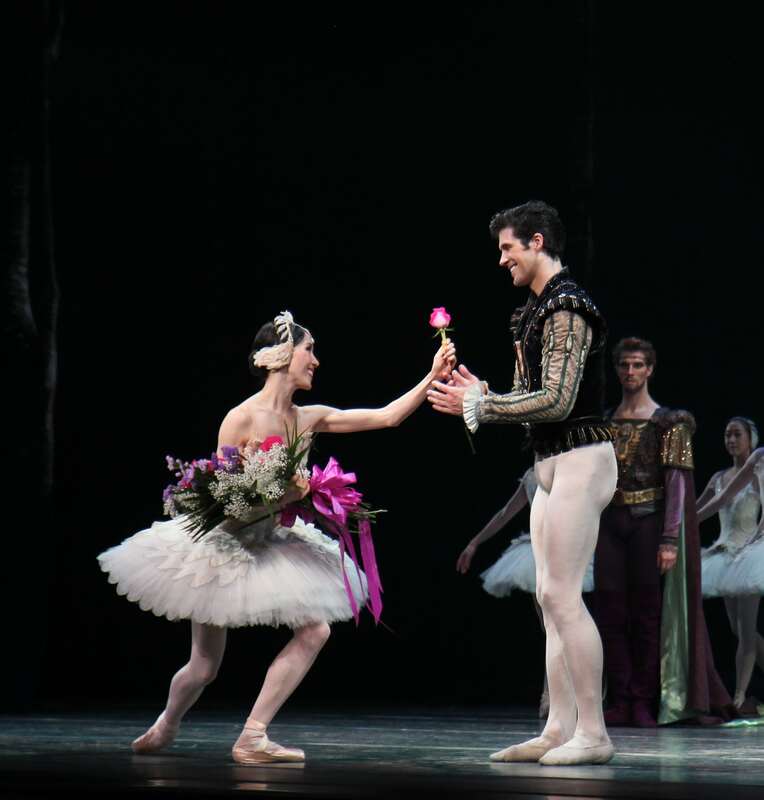 I photographed curtain calls for Nina’s final ABT performance, June 27, 2009 in Swan Lake. Nina was a great dancer with great range, from classical and Romantic 19th century ballets, to more contemporary works. She was an international star, performing all over the world. Because of Mikhail Gorbachev’s Glasnost policy, she was allowed to perform outside the Soviet Union as a guest artist starting in 1986. She joined ABT in 1993 as a Principal Dancer. My early photos were fairly standard, centered photos of a dancer in a pose. After a while it was getting boring. During Nina’s curtain calls, I experimented with various perspectives. My favorite, which I use on my YouTube channel, is a wide-angle view, as many swans gave Nina an ovation for a great career. Angel Corella final performance. Click for more photos. For Angel’s finale, I upgraded my equipment to a good consumer camera, Canon 2ti, and a great lens, 17-55mm f2.8. From my front row vantage point, I captured a number of photos of the historic event. I use this photo for the introduction to my ballet video dictionary (see the link above for Nina). At that point, I had accumulated a number of curtain call, church, landscape photos. What good is having photos and not showing them off? So in September 2011, I debuted my photography website, notmydayjobphotography.com with a SmugMug interface. With the website, I had the opportunity to show my work, but with a great lag. I took me many days, if not weeks to process my photos in Aperture, an Apple photo processing tool, trying to get them just right. Ethan Stiefel final performance. Click for more photos. For his final ABT performance, Ethan danced the role of Ali in Le Corsaire, dazzling the crowd with reckless abandon and bravura dancing including turns in second with a leap in the middle, a spectacular manège of coupé jetés, and endless pirouettes. On my photography, I was experimenting with various perspectives and crops. I took a number of standard photos, which turned out well. However, my favorite is this, where Ethan walked to the other end of the stage to address the crowd. I cropped the photo to put Ethan a third of the way into the photo. Many photographers use the Rule of Thirds to compose photos and this is an example, with Ethan staring into the dark with a spotlight shining on him. Irina Dvorovenko final performance. Click for more photos. I’ve always loved Irina’s athletic dancing with her dramatic expressiveness. I was fortunate that her final ABT performance was part of my subscription package. But there was a problem: my wife had a conference in Philadelphia that weekend and I wanted to go. Not a problem with East Coast transportation. I went to Philadelphia on Friday with my family; took an Amtrak train back Saturday afternoon; attended the Onegin performance; worked on the photos until about 1 am; uploaded the photos to notmydayjobphotoraphy.com; publicized the photos on Twitter; took the 3 am Amtrak to Philadelphia and slipped into my hotel bed around 5 am. With help from Haglund, I had a number of hits on notmydayjobphotography.com and favorites and retweets on Twitter. My lesson was that there was a demand for timely ballet news on social media and my goal going forward was to attempt to meet that demand. Tiler Peck. Click for more photos. Most of my curtain call photos are of ABT, but I started branching out to NYCB and other companies in 2013. Here is a photo of one of my favorite NYCB dancers, Tiler Peck in Balanchine’s Symphony in Three Movements. Note the Balanchine style bow, with her left foot flexed rather than flat to the floor as in the photo below. Veronika Part. Click for more photos. This is my all-time favorite, Veronika Part after a great performance with Marcelo Gomes in Sleeping Beauty. The photo adorns the top of my blog masthead. I love her elegant pose in front of the black backstage as she acknowledges her many fans. Natalia Osipova and David Hallberg. Click for more photos. I usually sit on the side rather than center, giving me a more interesting perspective. Here is an example with David Hallberg peering out into the audience while Natalia rests her head on his shoulder after a wonderful Romeo and Juliet performance. Polina Semionova and Cory Stearns. Click for more photos. Most of my photos are taken from the front row of the orchestra. This photo is a departure as it is from the second balcony of Koch Theater, giving a nice overhead perspective. Polina is a great dancer, one of my favorites with her outstanding combination of athleticism and elegance. This photo appeared in this blog, balletfocus.com, which debuted in September 2013. The blog provides ballet and photography commentary with photos mixed in with my reviews. Olga Smirnova and Semyon Chudin. Click for more photos. Here is a shot from a similar vantage point, second ring at Koch Theater, of The Bolshoi’s Swan Lake. The beautiful blue lights shine on Olga and Semyon after a great performance. Oxana Skorik and Xander Parish. Click for more photos. This is a nonstandard perspective of a Swan Lake curtain call bow, from the Mariinsky Ballet at Brooklyn Academy of Music. I cropped the shot low to emphasize the dancers. Although Oxana and Xander’s faces are not visible, I think the pose is dramatic. Diana Vishneva. Click for more photos. A heartfelt thanks from Diana after a great performance of Giselle. Diana has been a crowd favorite at ABT since her first ABT performance in 2003. A beautiful dancer with a great line and grace, she excels in dramatic roles such as Giselle and Romeo and Juliet. Uliana Lopatkina. Click for more photos. Uliana Lopatkina gives a theatrical bow after her rendition of The Dying Swan at BAM. I like the great contrast between her white costume against the deep black background. Most of my time in post-processing is selecting the right photo and cropping. After a ballet, I have a number of images to choose from. I can generally delete over half of the photos in the first pass. I usually go through the images a second and third time as I get acclimated to my choices, putting stars on images that have potential. After several passes, I have a handful of photos to work with. As I noted above, I work with a few adjustment sliders to obtain the right look. I spend the most amount of time cropping. Although cropping is not the most technical post-processing work, it is important as it frames the image. Cropping is a vital as composition can make or break a photo. I generally try to avoid centering the dancer; an off-center look is more interesting, creating tension and interest. I do my post-processing work in Lightroom and my adjustments are generally modest. I typically turn down the highlights and vignette, which darkens the corners. I also use de-noise and sometimes the clarity adjustment. In this photo, I increased the contrast a bit to make the dark areas darker. Over time, my processing time has been greatly reduced as I’ve gained more experience. What took weeks to finish now takes a few hours. Generally, I can get photos out on this blog and on Twitter by 1 am after an evening performance. It takes some luck to be in the right place for a shot. Here is an example. My vantage point that night afforded a view of Hee and Roberto in profile as Hee passes a rose to him. Many shots go into the digital trash can because a dancer’s face is covered. It also helps to photograph Roberto. He is so telegenic, with a wide, effortless smile; it is impossible to take a bad photo of him. I absolutely love this collection of photos!